Posted 9:16 pm by Rena Anya Devéza & filed under Alexander Technique, torn meniscus. As I was being prepped for the surgery, I found myself doing whispered ahs and directing. “Let my neck be free” I kept saying to myself. “Lengthen and widen.” I had a chat with the anesthesiologist about the technique. She had never heard of it (so what else is new?) but she was intrigued and she promised to research it out. I certainly hope she does! Later, after the surgery, when I came back into consciousness, I realized that lots of the mental stress I had been carrying around, touching on all aspects of my life, had disappeared. I had known that this whole scene of waiting for the surgery to happen had been really stressing me out. Surgery over…stress reduced. I had a lesson two days before the surgery. For that lesson I did table, then hands on back of chair while seated, then table again. I wanted to go over hands on back of chair, as I had done that activity two days previously when I paid a visit to my training course. My teacher and I went over this three or four times. Hands on back of chair is something that I will be able to do now, in this immediate post-operative stage. Easier than standing, of course, but anyway I cannot get into a position of mechanical advantage–aka a monkey–at the moment. All in all this little grouping of my last three lessons was noteworthy. I had been walking around in mega-pain in my legs, and in fact, all over my body. I must have been crunching down big time. Ha! I must have gotten temporarily shorter. My neck/head/back alignment must have been pretty lousy. But then something happened during the first of these three lessons. With the assistance of my teacher, I managed to undo big time. Much of the pain just evaporated. It just vanished. It was magical, and of course this occurrence brought me back to why I had started lessons in the first place. After each of these three lessons, I walked out with that light as a feather feeling, that feeling one wants and learns to expect after a lesson. I felt kind of terrific even though I as walking in slow motion. We talked meniscus surgery and recuperation strategies. Bags of frozen peas. That’s what he recommended for the continual post-operative icing of the knee. I did stock up on a few large bags of frozen peas so that I can rotate them as needed. Let me tell you, this scenario is certainly better than dealing with ice cubes. Who knew? 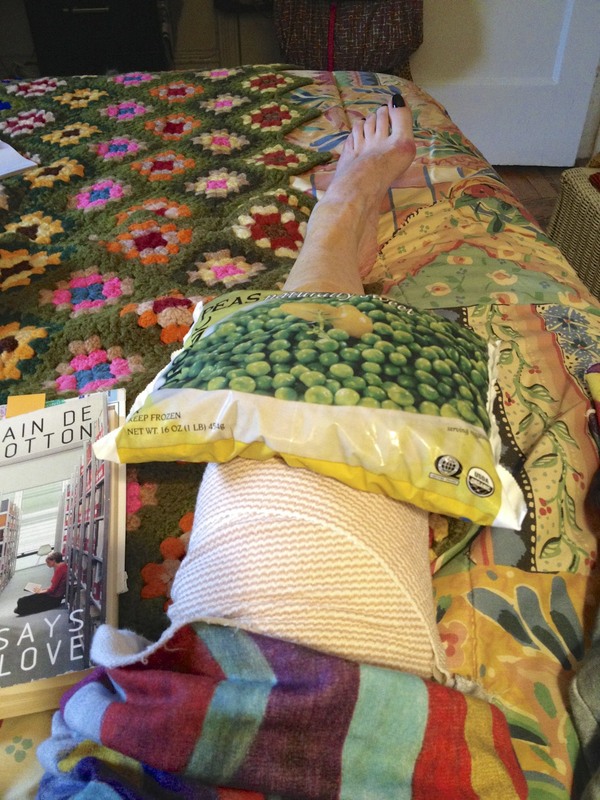 I received explicit instructions on how to frozen-pea-up my knee. Alas, I am so susceptible to the cold. One word only in French means “susceptible to the cold.” How economical! The feminine version of that word is frileuse. All who know me know that I am always frileuse. Moi je suis frileuse. And here I am with a frozen pea ice pack perched on my knee for three to four hours at a time. Then I get to take it off for an hour. Ah, heaven: a short respite from the cold!